Welcome to one of my most resource-filled posts ever! 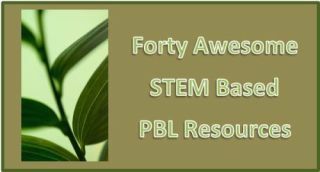 One that is dedicated to highlighting some amazing free resources that will help support STEM-based PBL in the classroom . Before introducing this goldmine of resources… I want to thank you for continuing to return and for continuing to sharing my blog 21centuryedtech with others. If you haven’t subscribed, please visit 21centuryedtech and subscribe by RSS or Email. You will be guaranteed future posts by subscribing by either RSS or email. I also invite you to follow me on Twitter at mjgormans. I really do enjoy networking with all of you! Now… on to that goldmine I promised you. Have a great week! The sites below are considered to be great resources that provide ideas or blueprints for an entire PBL project. Included in most plans are project titles, content addressed, 21st century skills, driving questions, products, procedures, and evaluation. The resources in this collection tend to focus on the entire PBL process. BIE.org – The people at the BUCK Institute For Education have a great area where you can search for activities and projects already made. Note how many projects include both math and science. Want an extra bonus? Include the arts and make STEAM! Teach 21 – The educators in the state of West Virginia at Global 21 have provided this amazing PBL site. Just pick a grade level and subject area. You will find projects that encompass the STEM areas. Learning Reviews – The PBL portion of this site provides some outstanding links to web resources that cover science, math, engineering and technology. You will find grade levels along with the number of resources supplied. Real Wold Math PBL - Small selection of projects based on math skills. Math Matter Geometry - Selection of 10 Geometry projects developed in Indiana and hosted by Indiana University. Math Matter Algebra 1 - Selection of about 20 Algebra 1 Projects from Math Matters at Indiana University designed for middle school. Math Matters Algebra 2 - Selection of over 20 Algebra 2 Projects from Math Matters at Indiana University designed for high school. iEarn - Projects based on contemporary issues with an emphasis towards collaboration beyond your district, state, and country.community of high schools. High Tech High School - Seven projects that have been successful at this PBL based school. National Service Learning Clearing House - Hundreds of ideas. While not all may be PBL… they could sure be remixed to have all the components! Exemplary Projects - While there are not a lot of projects… there are some cool ideas. The following sites could be used as a foundation to build a PBL unit. Perhaps you’ll just want to use a portion of the site for a product, lesson, lecture, video, simulation, or activity in a new or existing PBL unit. While many focus on competition… remember that you do not have to compete., although it could be fun. Look at it as a giant smorgasbord of resources ready to be served up in building a STEM based PBL unit. Siemens We Can Change The World Challenge – Great site loaded with resources, standards, and ideas. Either compete or just use the resources that are provided. Applicable to all levels of K-12 education. Kids Science Challenge – Awesome and inspiring challenges involving bio-designed scientific inventions, sports on Mars, and detective science. Be sure to check out the great podcasts listed in Pulse of the Planet. Young Scientists Challenge – Great resource for students in K-8. Lessons, multi-media, and other materials that can be incorporated into PBL units. National Engineer Week: Future City – Great Project Based Learning Activity incorporating STEAM along with Language Arts and Social Studies. Engage students with Sim City Software, model building, and a new curriculum designed to integrate disciplines. The Jason Project – Wow, what an awesome set of free digital curricula filled with multi-media, simulations, readings, class activities, and projects! Check out that roller coaster simulation just to name one! Siemens Discovery STEM Academy – Vast amount of lessons, multimedia and activities, along with webinars, that are some of the finest for both student learning and teacher professional development. eGFI Dream Up The Future – A huge database that will engage students with its colorful and student centered interface. Make sure to check all the links, including all the STEM resources found in the Teacher Resource area. NSF Resources For STEM Education – A great collection of teacher resources, instructional materials, assessment, and up-to-date research regarding STEM. PBS STEM Education Resources Center – Great information from PBS including engaging lessons, activities, and of course those award winning PBS videos. NSDL – The National Science Digital Library has some outstanding resource that include numerous links to some great STEM programs and organizations. Design Squad Nation – Another great service from PBS filled with some entertaining and engaging ways to integrate STEM into any classroom. Museum of Science – Great database to search for lessons and ideas involving science, math, engineering from one of the finest science museums located in Boston. Discover Engineering – Let your students discover engineering in some very exciting and engaging ways. From skateboards to roller coasters the activities and videos will bring you back for more. ACSEville - The civil engineers at ASCEville have some amazing simulations, games, and adventures for your students. Have you ever built a gum drop dome or a paper bridge? Check it out… you may not want to leave! Google Science Fair – How about a virtual science fair that can go beyond your classroom, district, state, and even nation? This is an event that will turn on the 21st century skills and the new common core! KhanAcademy – Ready to flip the STEM classroom? Then check out these thousands of videos from Khan! Every area of Science and Math can be explored in short informative video clips. Either do a total flip or just reinforce skills in a short student controlled lesson. TeachersDomain – Want to continue doing a flip? Then visit this site from WGBH, a PBS station in Boston. You will find videos, activities, and simulations! Best of all, you can archive it in your own classroom at the Teachers Domain Site. PBS Teachers - Brand new site filled with lots of resources and videos. Search by grade level and curriculum area. Teachers can create an online classroom filled with outstanding and engaging material. Wolframalpha – Not your typical search engine. This is a computational search engine that is a plus for any STEM educator. It is easy to use and its ability to find data is just plain fun! Ciese- Dedicated to improving K-16 STEM education through the meaningful and effective integration of technology, CIESE fosters the use of research-based instructional methodologies and technologies to improve and pioneer novel technologies to explore and better understand their impact on improved education and society. My Science Box- At My Science Box you’ll find complete, scaffolded lesson plans to teach a 4-6 week middle school science unit through activities, projects, and field trips. Physics Online - Check out the projects link for some ideas that just might start a project. Molecules Matters - provides PBL instruction and support for students and teachers with an emphasis on nanotechnology. How about free software to promote STEM in the classroom? Along with multimedia programs such as Movie Maker and iMovie… the programs listed below will facilitate students in their 21st century skill development. Since they are free, students can use them at school and download them to also connect at home. SketchUp - A great CAD style product from the people at Google. I like to call it “CAD that’s fun!” Explore a world of educational resources that will engage students in the classroom allowing them to innovate and create! West Point Bridge Project – Whether it be math, science, or engineering… students will enjoy this free program from the West Point Academy. Watch students compete in collaborative groups as they learn valuable content and understand the world of math and science through simulations and modeling. Scratch – Wow… computational thinking at its best. A program that allows student to design a computer program with integration into any subject area. Learn more by watching my archived webinar at Discovery! Google Earth – Another free and amazing program that will excite your students in any STEM class. Make sure you visit this educator page filled with resources on how to use Google Earth in the classroom.